Mesquite celebrated the official opening of its third I-15 freeway interchange on July 21. It was a sizzling hot day, but a crowd of over 100 exuberant citizens turned out. There were high-fives all around for everyone who worked hard to accomplish this significant project for the City. Cheers welcomed the first big-rigs that rolled across the beautiful overpass built in a unique two-arch style. The opening of Exit 118 and completion of Lower Flat Top Mesa Drive are, indeed, a “double rainbow” for Mesquite’s future. 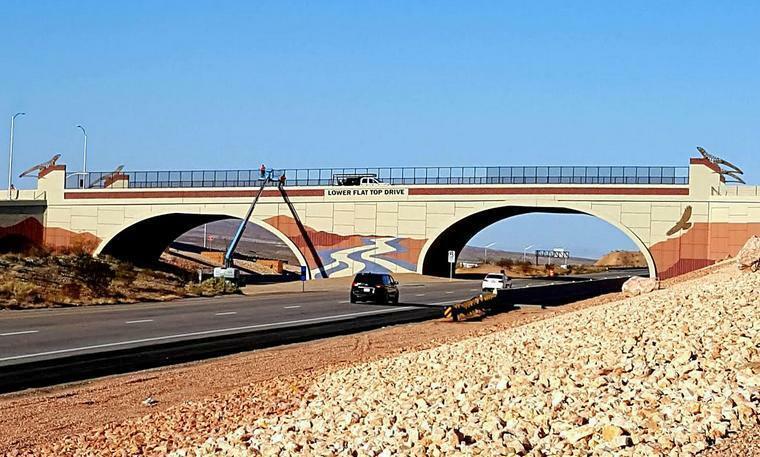 Travelers approaching Mesquite on I-15 will be excited to see the beautiful two-arch overpass structure. It is a unique design that allowed the massive project to be completed in only seven months. Most projects of this magnitude take a year to finish. 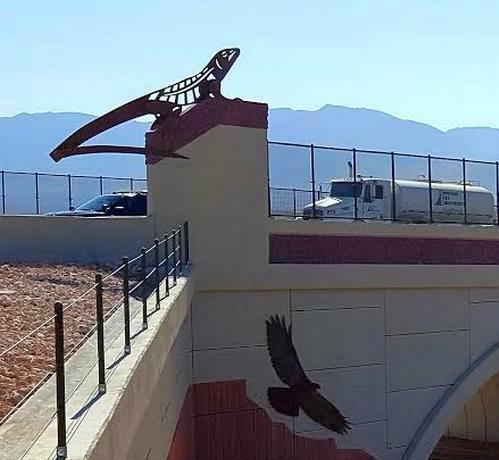 Both sides of the overpass feature murals that reflect the mountains, river and mesas surrounding the valley. Soaring hawks, lizards, desert bighorns and tortoises all make appearances on this new Nevada landmark. For recreational visitors, Exit 118 is a direct new route to the soccer and ball fields at the Mesquite Regional Sports Complex. It is also an easy access to the extensive bike and hiking trails at the base of the iconic Flat Top Mesa, and is a clear “no stoplight” shot to Conestoga Golf Course at Sun City. RV travelers who stop off at Exit 118 can head up Lower Flat Top Drive to Solstice RV Park and rent or purchase RV sites with million dollar views of the Virgin Valley.